Now, of course, we have all seen these bumper stickers all over the state of VT – In fact my previous vehicle bore this bumper sticker proudly. 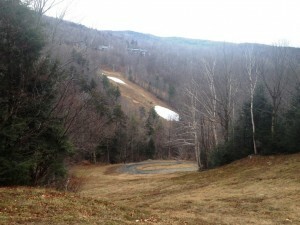 That said, given the lack of much in the way of snowmaking at this great old ski hill, the “Ski it if you can” moniker sometimes takes on a more cynical meaning. Alas, this was the case on Christmas Day this year. 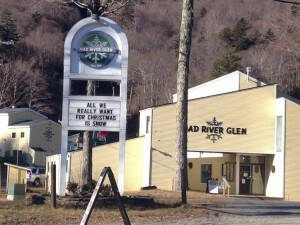 With the ridiculously warm temperatures in December this year, even the resorts with ample snowmaking have been hanging on for dear life, while poor Mad River Glen is yet to see an open day. That said, the warm Christmas morning temperatures in the 40’s made for an idea running day, so after the presents were all open, and I was chased, quite deservedly, out of the kitchen while others with superior Christmas dinner cooking abilities were preparing the evening’s feast, I thought it would be a great time to get out of the way, and spend a little time on the slopes, just in a different manner than I usually do. 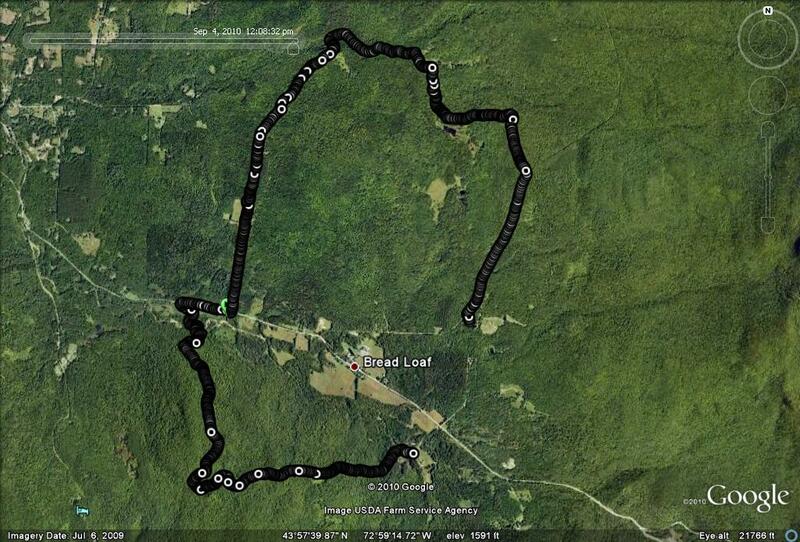 Several years ago, I described a run where I crossed over a lot of the terrain commonly associated with the Robert Frost environment – the Frost Cabin, the Robert Frost trail, and the Breadloaf campus in Ripton. 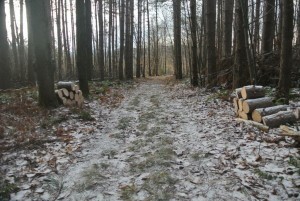 This run begins at the Robert Frost (note the theme!) 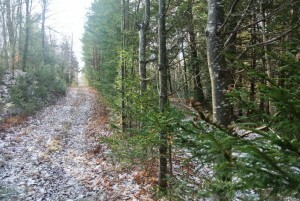 turnout and picnic area, and proceeds up the dirt road behind the Frost Cabin, known as the “Old Farm Road” on Rikert trail maps, before going deep into the forest behind Breadloaf. When I attempted to run this earlier this summer, I discovered that the blowdown from last December’s ice storm had rendered this stretch of trail impassable. 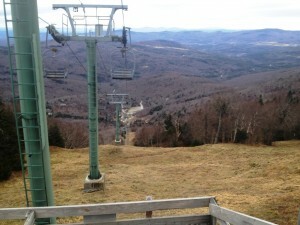 More recently, I had heard rumor that the trail had been cleared, as it is often groomed by the staff at the Rikert Ski Touring Area, and so I decided to revisit the route for the first time in over 5 years. 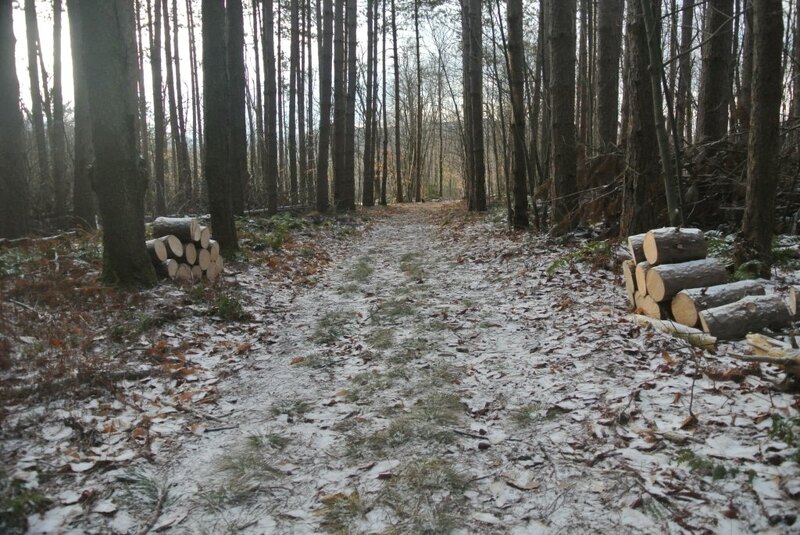 On a cool Saturday morning, I joined a friend from the Middlebury Trail Enthusiasts, noticing some of the first dustings of snow on the ground, signifying that just maybe winter is finally here? We headed eagerly up the hill, past the cabin, and I could see that the rumor was indeed true, and that the trail had been cleared. 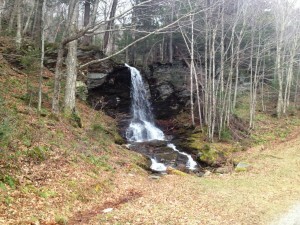 From this point, the route becomes more difficult to describe, as the trail system can get pretty complicated. The good news is that if you get off-route, you will hit a road sooner or later, and you would have to work pretty hard to not be somewhere in Ripton! We followed this trail until it forked by a sign labeled “Blue Bed House” on the right fork, but we took the left fork, and later when we came to a T in the trail, with a short steep downhills to the left, we chose the left again, until we got to the terminus of one of the Ripton dirt roads, known as “Wagon Wheel Road”, although there was no sign indicating this. Taking an immediate right turn, past a forest service road gate, on the trail labeled as “Wagonwheel Road” on the Rikert map, passing by the first of several beaver ponds, before coming to a more primitive trail with a sign calling it “Kiwi”, where we took a right. I knew from past experience that Kiwi is a trail which has been minimally maintained over the years, providing a more bushwhacking cross country ski experience than most of the Rikert trails, and this was apparent while running this short connector. 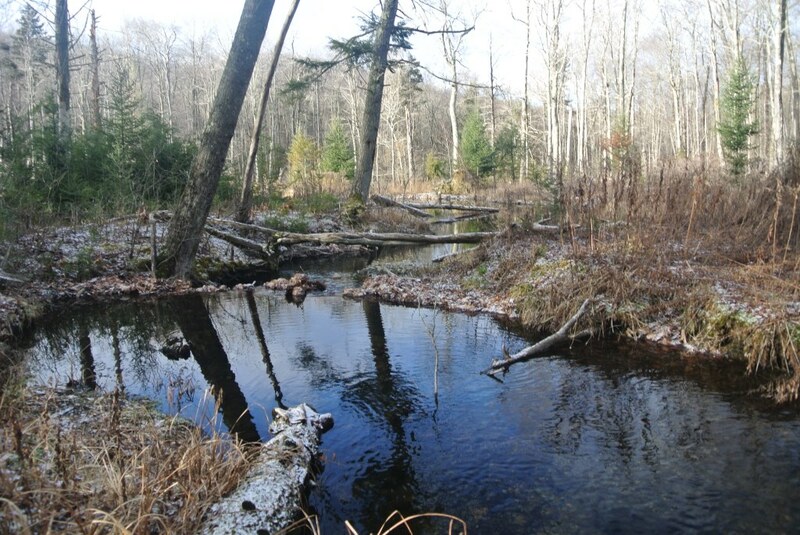 The big surprise however, was the observation that what I had remembered as a tiny stream crossing, had been enlarged significantly by beaver activity at some time in the last few years! 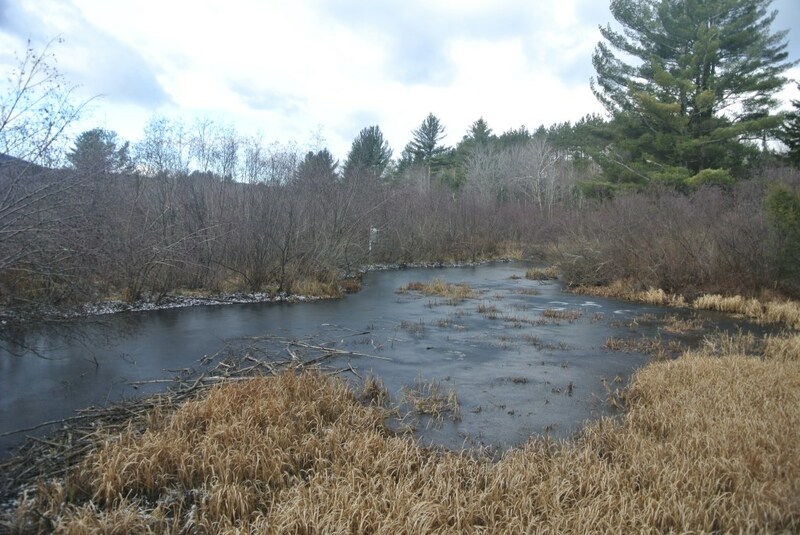 A series of small beaver dams were indeed crossable with wet feet but no wading, but I will be curious to see how well this freezes up for skiing this winter. Crossing the stream, we soon came to the more developed Brown Gate Trail, where we took a left up a modest climb which brought us to Forest Service Road 59, aka Steam Mill Road, a well developed dirt road which will hopefully shortly be closed off for the pleasure of skiers and snowmobile enthusiasts. From here, we took a right turn, heading gradually downhill for about a km, until we came to the left turn onto a trail clearly labelled as a snowmobile trail, past the small Kirby family graveyard, until we came to a short section where the snowmobile trail was separated from the Rikert Battell trail. These side by side trails, one for skiers and one for motorized winter travelers were now were more clearly separated by the planting of a line of pine trees in the late 80’s, and now the trees are about 30 feet high! I guess I have been here a long time. The trail then veered to the right, and descended to Rt 125, where we crossed the road, and onto Brooks Rd, one of my longtime favorite trailheads, and when we got to the parking lot, we ran to the back of it and started uphill on the Widows Clearing trail, our last real climb of the day, until we reached the actual clearing. I discussed some of the story of the widow herself a few years ago, and it was the most commented on posting I have ever done – apparently a lot of people were curious as to the story of this place. Not long after the Widows Clearing, we came to a T in the trail, where we went right on a trail called “The Crosswalk, a muddy descending trail which brought us after about a mile to the back of the well-loved Robert Frost Trail. 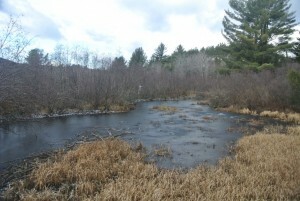 After crossing over the new (as in a few years old new) handicapped accessible bridge, we finished off the trail portion of the run with a few moments at the last beaver pond of the day, ringed with the first traces of the season’s ice. 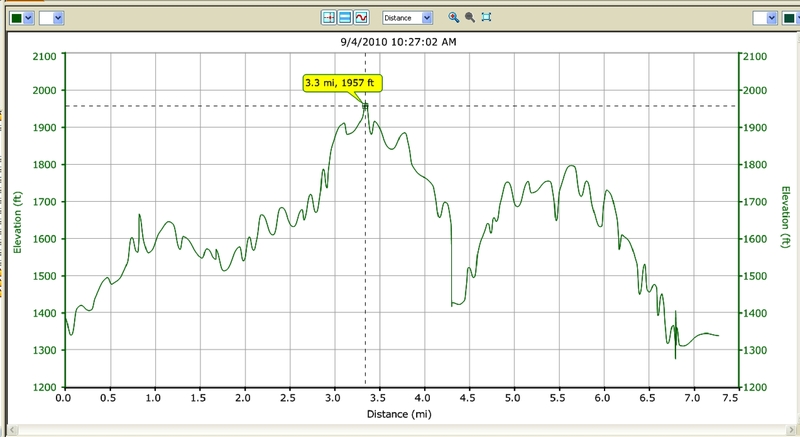 Returning to Rt 125, we had a short run alongside the highway, returning to our cars, for a round trip run of about 8.5 miles.I usually post the Google Earth projection of these runs, but I apparently had a malfunction on this run, so I am going to refer readers to a previous posting, where I included this, as well as the altitude profile.